Exciting new images from NASA’s robotic spacecraft Lunar Reconnaissance Orbiter (LRO) which is orbiting the Moon since 2009. China’s lunar lander Chang’e 4 which achieved the first soft landing on the far side of the Moon and its surroundings in Von Kármán crater can be seen in the images. Lunar Reconnaissance Orbiter took these photos on January 30, 2019. Original full-size photos (in .tiff format) can be downloaded from the LRO official website by Arizona State University. Arrows indicate the position of Chang’e 4 lander on the floor of Von Kármán crater. The sharp crater behind and to the left of the landing site is 3900 meters across (12,800 feet) and 600 meters (1970 feet) deep. The image was shrunk by more than a factor of ten. LROC NAC M1303521387LR [NASA/GSFC/Arizona State University].Original full-size photos (in .tiff format) can be downloaded from the LRO official website by Arizona State University. On January 3, 2019, Chang’e 4 has landed specifically within a crater called Von Kármán, which has a diameter of 186 km (116 miles). The crater is named after the Hungarian-American mathematician, aerospace engineer, and physicist Theodore von Kármán (11 May 1881 – 6 May 1963). He was the Ph.D. advisor of Qian Xuesen (11 December 1911 – 31 October 2009), the founder of the Chinese space program. So, the landing site of Chang’e 4 has symbolic as well as scientific value. 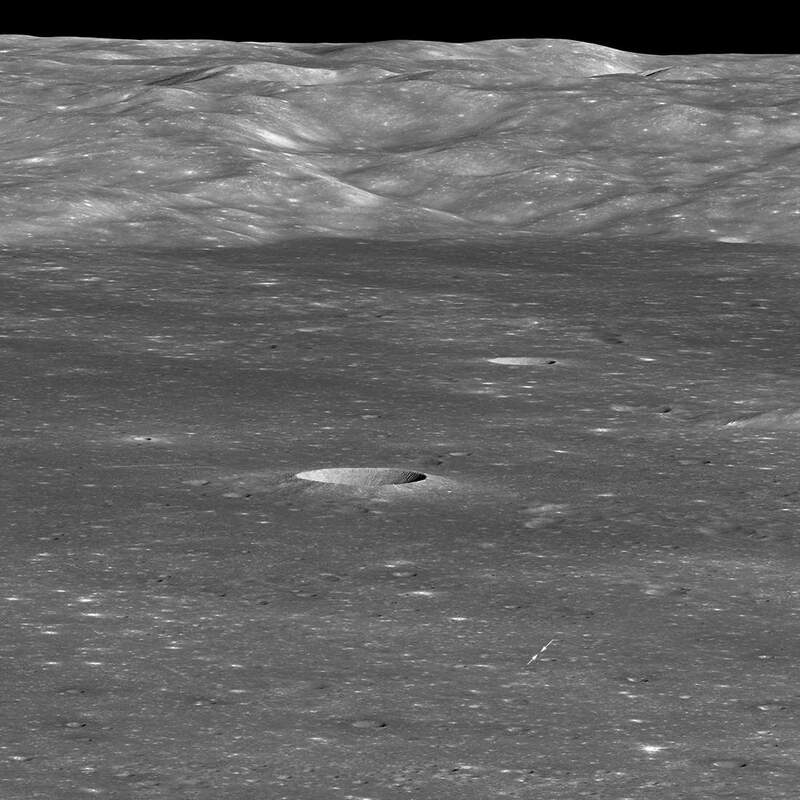 Four weeks later (30 January 2019), as LRO approached the crater from the east, it rolled 70° to the west to snap the spectacular view looking across the floor towards the west wall. Because LRO was 330 kilometers (205 miles) to the east of the landing site, the Chang’e 4 lander is only about two pixels across (the bright spot between the two arrows), and the small rover Yutu 2 is not detectable in the photo. The massive mountain range in the background is the west wall of Von Kármán crater, rising more than 3000 meters (9850 feet) above the floor.